WITH AN AREA of 26,830 square mi (69,490 square km), Lake Victoria is the largest lake in Africa and, after Lake SUPERIOR in North America, the second largest lake in the world. 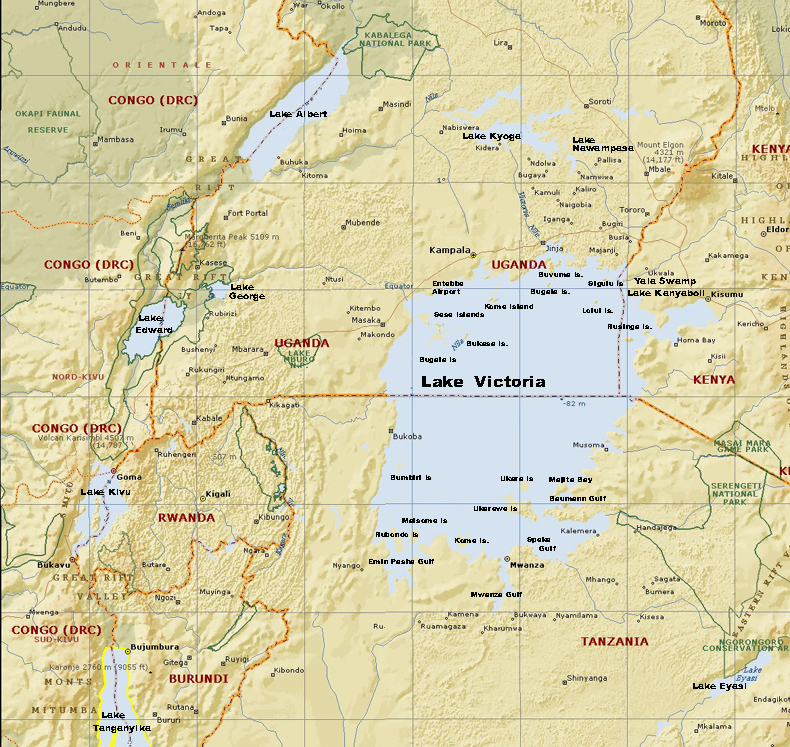 At 3,720 ft (1,130 m) above sea level, Lake Victoria is bordered by UGANDA, KENYA, and TANZANIA. It is 209 mi (337 km) at its greatest length and 150 mi (240 km) at its greatest width. Lake Victoria is located between two ranges of the Great Rift Valley on a depression with 250 ft (75 m) at its greatest depth. Also known as Victorian Nyanza and, during the period of Arab influence in the 18th and 19th centuries as Ukerewe, Lake Victoria is fed by a multitude of rivers and streams, the most significant being the Kagera River. Lake Victoria flows into the NILE RIVER and begins a very long journey to the MEDITERRANEAN SEA. 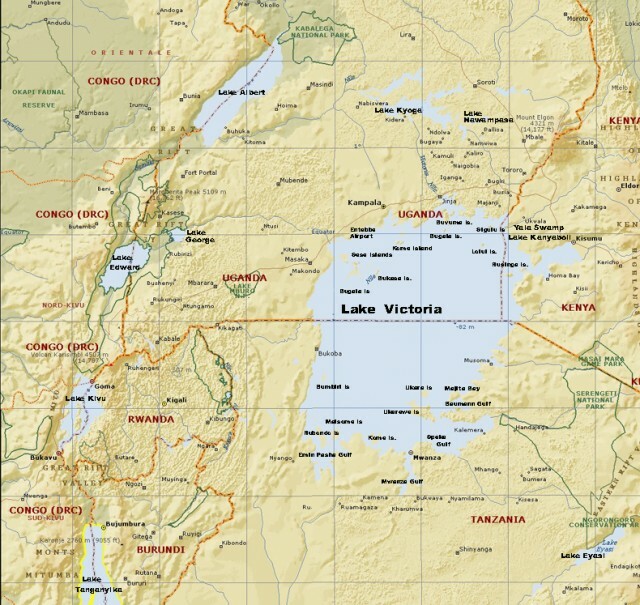 The rather shallow but huge lake is located near the equator; evaporation from Lake Victoria is significant and influences the climate of central sub-Saharan Africa. Lake Victoria has hundreds of small islands, especially along its northern (Ugandan) shore. Small fishing villages abound, and many people are supported by an economy based on Nile perches, tilapia, and omena. In the swamps and marshes of the northern shore, the Sitatunga antelope thrive. In 1858, while searching for the headwaters of the Nile River, John Hanning Speke was the first European to see Lake Victoria. The British journalist turned explorer Sir Henry Morton Stanley traveled around the entire lake in 1875. During the late 19th and early 20th centuries, Europeans—principally Britain and Germany— competed for control and influence in this region. During World War I, battles were fought on and about Lake Victoria; Britain defeated the weaker German colonial forces. The British led the way in the economic exploitation of the Lake Victoria region, which supported coffee, tea and sugar plantations. They introduced the use of agricultural chemicals that eventually threatened the ecological balance of Lake Victoria. As the native peoples gained political independence and the world recognized the impact of past practices on the environment, new governments, assisted by the United Kingdom, introduced measures to correct the imbalances that existed in Lake Victoria. Many species of fish had become extinct; new species were introduced and some of them eliminated additional species. had been abandoned in 1977. RWANDA and BURUNDI have expressed interest in joining the EAC, which is focused on improving the lives of the 108 million people who live in the region dominated by Lake Victoria, Lake Kivu, and Lake TANGANIKA. In addition to the planned custom union and common market, the members are dedicated to restoring the environment of the Lakes. Along with the Community of East and Southern African States (COMESA), the new EAC is focused on the new “Great Lakes Region.” In addition to restoring the environmental vitality of the lakes, these organizations are interested in the potential for clean hydro-electric power to minimize their dependency on oil and other carbon fuels.